​Coordinated and lively protests were carried out Wednesday by medical marijuana patient advocates in both Saginaw, Michigan, and San Diego, California, against the Drug Enforcement Administration for raids it conducted earlier this month. The raids were made despite an official Justice Department policy issued in October 2009 discouraging such enforcement. The Michigan Medical Marijuana Association organized the Saginaw protest march, and Americans for Safe Access (ASA) organized a rally at the federal courthouse in San Diego. More than 100 medical marijuana supporters demonstrated in Saginaw, coming from across Michigan after hearing about police raids on medical marijuana growers and patients in Saginaw County, reports Kim Russell of NBC 25. The DEA raided John Roberts and Stephanie Whisman, two licensed medical marijuana caregivers from Thomas Township, Mich., on July 6. The next day, on July 7, the DEA raided the Covelo, Calif., home of Joy Greenfield, operator of the first collective to apply for the Mendocino County Sheriff’s cultivation permit program. Greenfield even had county-issued “zip-ties” on her plants, designating their legality under state and local law. Then, on July 9, the DEA conducted multiple raids on medical marijuana dispensaries in the San Diego area, resulting in the arrests of 12 people. Among other items seized in the raids, the DEA took money, medical marijuana and cultivation equipment, as well as financial and private patient records. 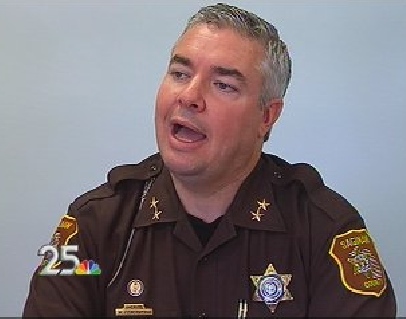 Saginaw County Sheriff William Federspiel claims he is “just doing his job.” Patients say otherwise. ​John Roberts, who was well below the legal marijuana limit as a Michigan caregiver, produced a medical marijuana oil that was used by seriously ill patients, including one six-year-old girl with brain cancer. The young girl, who because of the DEA raid will now go without her medication, successfully used the cannabis oil to treat her headaches, to help her sleep, and as an appetite stimulant. 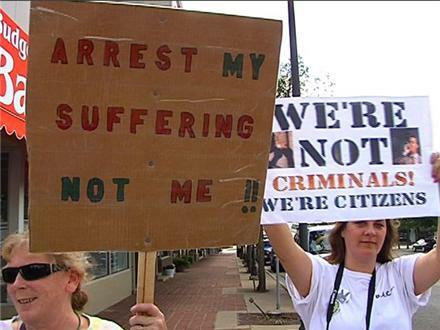 Roberts had held a protest less than a week before the July 6 DEA raid to bring attention to ongoing law enforcement harassment of patients in the Saginaw area. The most recent federal raids and subsequent protests came as Acting DEA Administrator Michele Leonhart is preparing to be confirmed by the Senate Judiciary Committee. Leonhart is a Bush Administration appointee who was deputy administrator under then-DEA Administrator Karen Tandy. Both were responsible for more than 200 raids in California and other medical marijuana states during the Bush Administration. In her capacity as acting administrator, Leonhart also blocked medical marijuana research in January of this year by refusing to grant a research application from the University of Massachusetts that would have expanded therapeutic studies in the United States.